Into The Nexus squeaks out just ahead of the PS4. 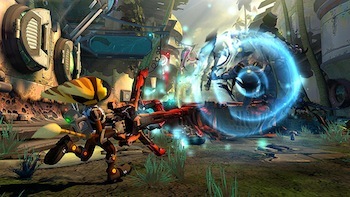 Ratchet and Clank: Into The Nexus will hit store shelves November 12, Sony announced today via the PlayStation Blog. Into The Nexus, a PS3-exclusive, is the last game in the series' "future" story arc, which spans Tools of Destruction, Quest For Booty, and A Crack in Time. The game will be shorter than what Ratchet and Clank fans may be used to, but will sport a $29.99 price tag to match. "The truth is, we relished this ability to tie a bow on the PS3 era of Ratchet with a shorter title." wrote Stevenson. "All of us love the Ratchet universe - and after 12 years developing the series, it feels like a very close friend. We have a lot of stories to tell, some longer, some shorter. This one felt just right. It's a very polished self-contained return to the Ratchet adventures of yore." Of course, it wouldn't be a release date announcement without pre-order bonuses. Players who put money down at certain retailers get the Pyronox Armor. Pre-ordering through Amazon will net players a set of Ratchet and Clank-themed PlayStation Home content. UPDATE: James Stevenson is the community manager for Insomniac Games, not Naughty Dog.